Since 1989, Taco has worked in international media business as a serial entrepreneur and angel investor. In the summer of 2016, he co-founded DFFNRT Media with fellow entrepreneurs Winston Gerschtanowitz (who was for many years the right hand of John de Mol (Talpal) as Chief Commercial Officer) and serial entrepreneur Bas Verhart. Prior to that, Taco served as Senior Vice President Prime Time Entertainment at ProSiebenSAT1, where he was responsible for all prime time entertainment, reality and comedy formats in SAT1. In 2015, SAT1 managed to grow its market share to 9.3% in the relevant target group 14-49. Ketelaar also serves as a board advisor to various leading international media companies and invests in various digital companies including as a co-founder of Creative Clicks – a leading global mobile marketing company. 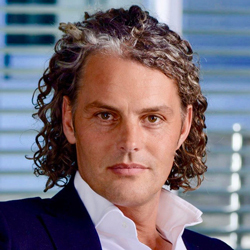 From 2009 until 2013, he was CEO/shareholder at format creator and television production house Blazhoffski Group. In 2011, BlazHoffski sold a majority stake to Warner Bros. Previously Taco was Chief Creative Officer and Co-Founder/shareholder of 2waytraffic, which was listed on the London Stock Exchange in 2006 at a valuation of €155mio and was acquired in 2008 by Sony Pictures Television. 2waytraffic is a specialist in the development of entertaining and interactive formats such as: ‘Who Wants to be a Millionaire?’. 2waytraffic is active in over 60 countries. Taco has held international management positions for 14 years at Endemol, including as Executive Director at Endemol Interactive International and Managing Director at ZimoH Productions (a subsidiary of Endemol. He is experienced in production of prime time programmes, such as the first and original series of Fear Factor, Surprise Surprise, Wedden dat?, Stars in Your Eyes (Soundmixshow), Don’t Forget Your Toothbrush, as well as charity and lottery shows. Taco studied marketing and communication and has held various guest lectureships at the University of Amsterdam.